This article is about the jump used in the Paper Mario series. For the jump used in the Mario vs. Donkey Kong series, see Spring Jump (Mario vs. Donkey Kong). For Sonic's special move in Super Smash Bros. Brawl, see Sonic the Hedgehog § Spring Jump. Mario charges up a Spring Jump. The Spring Jump is a move used in Paper Mario: The Thousand-Year Door. It adds one more base damage to each jump (which now is 3 damage per jump). It is also the strongest upgrade in the game. To obtain it, Mario must solve the many puzzles in Riverside Station. It can be used as a field or battle move. On the field it is used to jump extremely high. If Mario hits a ceiling, he will fall to the ground a piece of paper and if there is an item on top, it will fall down. Mario can grab Pipes to reach previously unreachable areas. It uses 4 FP and does 6 base damage (two jumps that deal 3 damage each). It is also the only way to get the Ultra Hammer. It uses the same Ultra Boots which in Paper Mario are used for the Tornado Jump, except that Mario retains his Spin Jump ability. The Stylish Move is performed by pressing at the highest point after the second hit. It does not award much extra Star Power. Assuming that there is a ceiling in battle, Mario will hit his head on the ceiling and fall down, consequently canceling the attack. However, the ceiling that Mario hit will come crashing down. 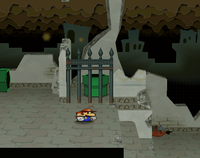 Luigi's super jump in Super Paper Mario is identical to the Spring Jump. This page was last edited on February 27, 2019, at 20:52.